We were a small select group this year for Ladies day at the RDS. Once again our tickets were given to us by Ms Joan O’Connor, a client of mine, to whom we are most grateful. F&I Association members, Grainne Sugars and Faith Ponsonby joined Lynn Petersen (BHS CEO) me and a friend Bridget Radnedge in the Judges and Stewards box for the morning entertainment of the 4 and 5 year old Young Event Horses. We then lunched in the Champagne Bar whilst watching some very smart Lightweight Hunters. 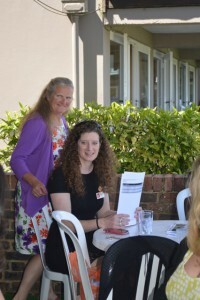 Lynn spent a busy afternoon shopping and networking, meeting up with the ladies who run the BHS stand – Susan Spratt (D.O. for Ireland) and Shelagh Laird (BHS Approvals officer for Ireland), Ms Linda Young of The Association of Irish Riding Schools and Declan McArdle who is another BHS Assessor and is employed by Teagasc , Ireland’s department of agriculture. Lynn has said she will not tell the BHS staff, who man the stands at various shows in the UK about the apparent luxury provided for Susan & Shelagh in the main shopping mall! We then met Joan’s beautiful yearling filly who arrived ready for her class on the Friday with the other mares and foals owned by the breeder Mr Derry Rothwell of Co. Wicklow. To get the chance to walk around the stables looking at all this magnificent horseflesh was a pleasure in its self, and I see from the Horse and Hound reports that many of the winners went home with other owners. It is a well known fact that the majority of people showing at RDS hope to take fewer horses home at the end of the week. It was fairly obvious who was buying what when and where. A trip to Simmonscourt afforded us the chance to see the show jumpers warming up ready for the afternoon’s jumping classes in the main arena, always interesting. Some light hearted demonstrations by Joel Chacon and Le Compte du Montacrue and later Clemence Faivre riding with no bridle as she performed some Haute Ecole movements around the Main Arena show jumps made sure we didn’t just watch show classes or jumping. I always feel I want to spend every day at the show, Ireland winning the Nations Cup on the Friday was magic on the TV it must have been fantastic to be there. However we did return on the Saturday when Fran, Bridget and I were treated by Joan to lunch in the tiered grandstand whilst watching two jumping competitions. Bridget was amazed as everyone stood up and stood very still whilst the Irish National Anthem was played for the winners of those two classes – Billy Twomey and Conor Swail, both Irishmen. Now that doesn’t happen at Hickstead! Well the 1st August arrived with the sun high in the sky, so there were lots of dresses on show in the F&I Box at Hickstead! Numbers were up to 26 this year, and it was great to see so many of you there! We had a super day thanks not only to the F&I Association, but also to great organising from Karen Irving, Senior Executive at the BHS and Alex Copeland the new Director of Education. Both were present to welcome and look after us. We were also honoured with the presence of our CEO Lynn Petersen who was, as always great company. Our Chairman Jillie Rogers arrived fresh off the plane from Ireland with the lovely Fran, who took these super photos. 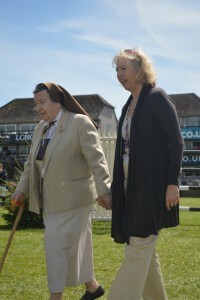 Alison Craig kindly picked up Sister Chiara, a lifelong BHS Member, and brought her along for an outing. She throughly enjoyed mixing with us all, old and new, and even participated in the annual course walk around the Queen Elizabeth II Cup course. A small committee meeting was also held with Jillie, Ann Bostock and Alison Craig. We had a lovely cold buffet lunch which included salmon, asparagus, new potatoes and various niceties, followed by a sumptuous creamy fruit pudding, strawberries and cream AND cheese and biscuits. Maybe we were meant to just choose one pudding??? All washed down with a nice glass of wine! The course walk was this year given by 25 year old rider Harriet Nutall, who hails from Somerset. She was very generous with her time and tips. I didn’t actually manage the course walk this year, but everyone seemed to glean lots of information. This brought us to the exciting competition and even more exciting sweep stake…which is always fiercely contested from our Box! 6 riders from 26 starters jumped clear round the 1.60m track. The winner was young rider Chloe Winchester who, at the age of just 21 was having her first ride in this class. Her 12 year old mare Avoca Valkyrie was drawn as penultimate horse and stormed home with 3.75 seconds to spare! “My” rider was drawn last, Phillip Miller on the lovely grey Caritiar Z. I really thought I was finally going to win the sweepstake this year, but although he jumped an incredible round, he crossed the line just over 3 seconds slower. The lucky winners of the sweepstake this year were Ann Bostock (fix!!!) and Bridget Radnedge. Well done Ladies! 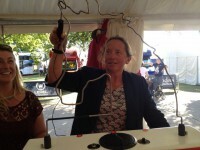 Oonagh Meyer and myself managed to finish the day off with some retail therapy, and had a go at the “electric horse’s head” game in the BHS tent, which Oonagh can be seen successfully attempting in one of the photos! Great fun and not easy after a couple of glasses of wine I can assure you!! !